Pick ups and Deliveries are normally scheduled for Wednesdays. When calling to schedule a pickup, please let us know any concerns you may have such as pet odors (urine, vomit, dander, etc. ), insects (moths, carpet beetles), etc. Rugs will be brought back to our office and thoroughly examined by ABC personnel. The customer will be called and asked for authorization before any work can be done. 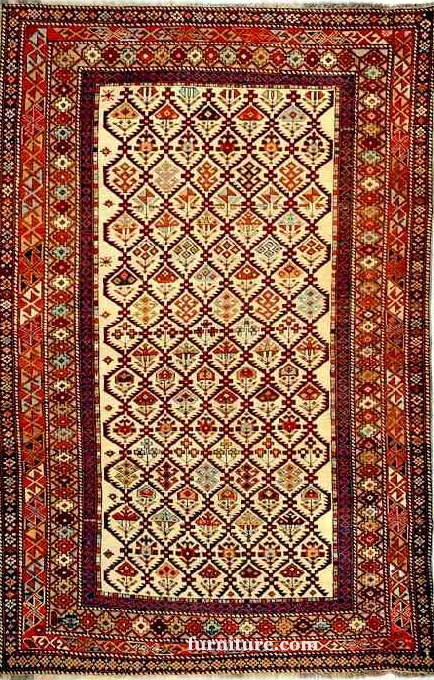 If, at the time of the pickup, it is determined the condition of a rug is questionable and any work done may exceed its value, a $200 deposit will be required before pickup. If the customer declines the work after the rug has been brought to our plant for examination, a portion of the deposit will be applied as labor and a disposal charge and and the rest will be returned to the customer. If the customer has the rug serviced, the $200 deposit will be subtracted from the final invoice. If at any point during the pickup, ABC personnel is unsure whether the rug is worth cleaning, a call will be made to the office. Rugs picked up on a Wednesday and cleaned in our plant will be scheduled to be returned the next Wednesday. If additional work, such as moth treatments or repairs are needed, the day of delivery schedule may have to be extended. Pickup and Delivery is free (minimum dollar amounts of work to be done may be required-see below). Rugs must be rolled or baled and ready for pickup. Cleaned rugs will be returned rolled or baled. A labor charge will be applied to any pickup which requires furniture moving and/or rolling, baling, or unrolling by our technicians. Please call our office at 607-272-1566 if any questions. Any orders picked up and delivered by ABC do not qualify for any in plant cleaning discounts unless specifically stated in the Discounts section of this website. If your area is not listed above, please contact our office. If you do not live in our service area, please feel free to call our office at 607-272-1566 and arrange to send us your rugs by mail or through a delivery service such as Fed Ex or UPS. 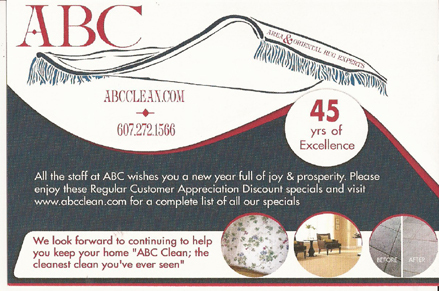 Why not think 'outside the box' and give a Gift Certificate for professional carpet, upholstery, or tile & grout cleaning from ABC for any special occasion! 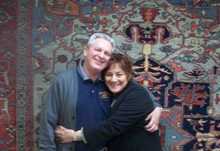 Does a special person have a favorite area rug or oriental rug that needs cleaning or repair? Just give us a call. You'll make their day! Bring in the mats from a car and we'll clean them as well. Contact us if you live in the Ithaca, NY or surrounding areas and we will tailor a special gift certificate just for you for any Special Occasion.